Made by Unknown (person) in Hermannsburg, Northern Territory, c.1965. This rug is of great significance because of the rarity of it and also it’s historical importance of combining traditional Indigenous stitching techniques with modern European patchwork influences in the design. It represents the work that was being produced at Hermannsburg during the 1960s. The label attached to the back of the rug “Product of Hermannsburg Mission Central Australia” also contributes to its rare significance as there are only two of these rugs known in existence. 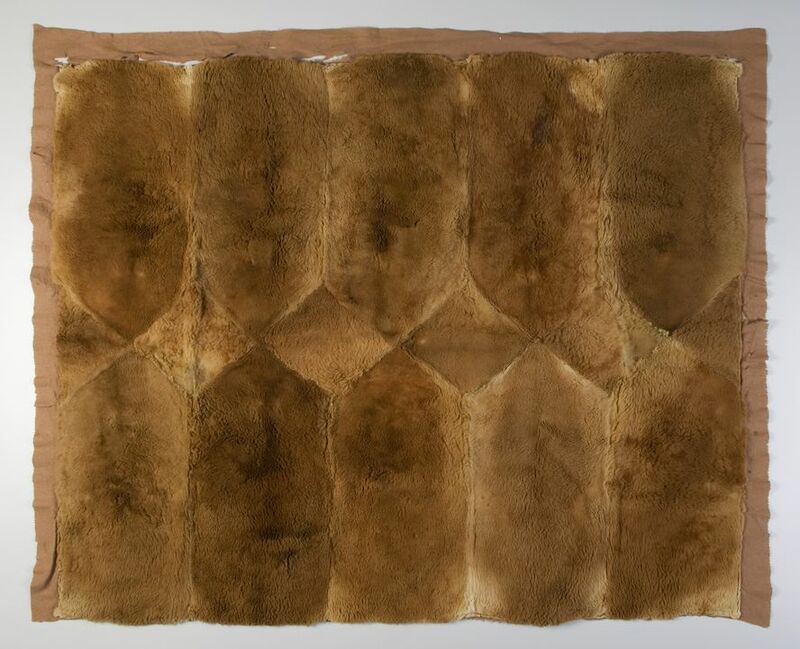 A rug made from 16 pieces of kangaroo skin that have been cut into diamond shapes, sewn together and then attached onto a brown felt backing. Makers label attached. The label "Product of Hermannsburg Mission Central Australia" is sewn on the back of the rug. This rug was produced by several unknown women from the Hermannsburg Mission tannery, Northern Territory in about 1965. These kangaroo rugs appear to have been produced to sell as products of the Hermannsburg Mission in the early-mid 1960s. Historically Indigenous people made and used skin rugs and cloaks for warmth during the colder season and to lay on at night to sleep. This particular rug is of historical importance as it represents a shared cultural background being made with traditional Aboriginal hand stitching whilst using the introduced European patchwork design elements. The untanned skins for this rug were provided by Ellen Blunden, then a governess at a Cattle Station in Central Ausstralia. The finished rug has been in Ellen's possession since then.